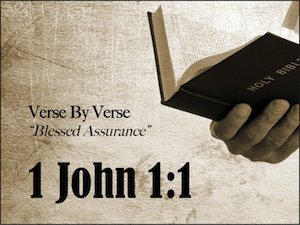 In the final phrase of this verse, John refers to the God/man as the “Word of life”. Few things are more compelling to us than questions about the origin and future of life. Every mature person wants to know where they came from and where they are going. These mysteries drive us. They haunt us in the moments before a surgery and they nag at us in the moments after a funeral. We run from the answers when they do not validate our life-style and we run after the answers when our life-style exhausts our hope. Life is the one thing we cannot replace. It defines us. It gives us purpose and existence. It is why we are. With that small phrase, “Word of life”, John launches us into a study of man’s greatest hope and all of the answers to man’s most pressing questions. Because “the Word of life” became tangible, the assurance of our eternal life can also be understood. When Gabriel was very small, he would lie on my chest as he fell asleep. I held his tiny hand and caressed his little blonde head. While he was being carried inside his mother’s womb I knew about him, but now that he has lived among us, I can say with certainty that I know him. I have heard him. I have seen him. I have touched him with my own hands. He is the evidence and communication of the love Cindy and I share. Can the world see the evidence and communication of God’s love when they look at you? For assurance to be sure, we must let God speak for Himself. We must be true to the inspired context. After each study, read the entire chapter again taking note to the way today's verse relates to all the verses around it. Due to the colorful, complex nature of the original language, the best translation is multiple translations. Following each lesson, this chapter will be presented in a different translation. Below we have featured the American Standard Version. That which was from the beginning, that which we have heard, that which we have seen with our eyes, that which we beheld, and our hands handled, concerning the Word of life (and the life was manifested, and we have seen, and bear witness, and declare unto you the life, the eternal life, which was with the Father, and was manifested unto us); that which we have seen and heard declare we unto you also, that ye also may have fellowship with us:yea, and our fellowship is with the Father, and with his Son Jesus Christ: and these things we write, that our joy may be made full. If we say that we have no sin, we deceive ourselves, and the truth is not in us. If we confess our sins, he is faithful and righteous to forgive us our sins, and to cleanse us from all unrighteousness. If we say that we have not sinned, we make him a liar, and his word is not in us. Missed Part 1 of this series or want to go back again? This is the link for you! Back to Top of "Jesus - Word of Life"